Brandon Fetter - Siegmund Excavation & Construction, Inc.
Brandon Fetter has been changing hard hats a lot lately at Siegmund. Brandon started working at Siegmund Landscape Supply as a delivery driver and laborer just over a year ago. Recently, he’s begun splitting his time between the landscape yard and Siegmund Excavation’s construction sites. After high school, Brandon worked on a farm for a short time, before going to work for a landscaping company in Olympia, Washington. 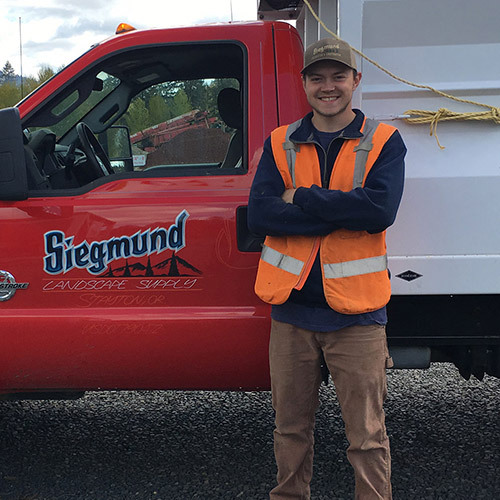 He moved back to Stayton and began working for a cleaning company, before coming to Siegmund for a new experience. In high school, Brandon enjoyed manufacturing and woodshop. Outside of school he could be found camping, hiking, and enjoying the outdoors. Now he spends his free time with his girlfriend and his family and friends. Siegmund Excavation & Construction, Inc.